The West Duluth Municipal Building, designed by Frederick German, was built in 1915 at 601 North Central Avenue, just across Cody Street from the old village hall, which it was designed to replace. The two-story Classical Revival-style building is faced in brick with concrete trim surrounding decorative entrances on its Cody Street façade. The first floor held both the fire hall and police station, which included cells for men, women and juvenile prisoners. The second floor was used for offices, the municipal court, and a dormitory for firemen. After Duluth’s new city hall opened in 1928, the municipal court in West Duluth was no longer used. For a time during the 1930s the Duluth News Tribune and Herald used the court facilities and offices as its West Duluth office. 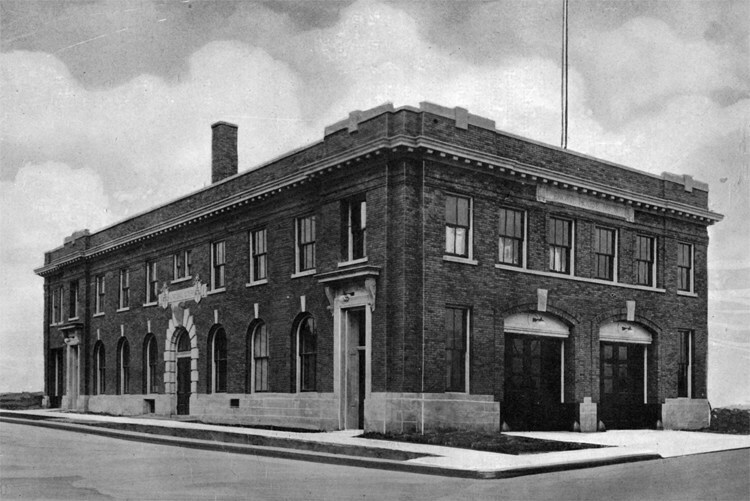 The Police Department moved out by the 1960s, but the building served as Fire Hall #8 until City Center West opened in l991 at 5830 Grand Avenue. In 1995 architect Alan Adams purchased the 1916 Municipal Building and converted it into the Lattner Apartments. As of 2017 it still served as an apartment building.